Shimon Peres, the last of Israel’s founding fathers — and one of my heroes — died earlier this morning (in Israel; last night in the U.S.), following a massive stroke. He was 93. Why a hero? He devoted his life to maintaining Israel’s security in a violent and hostile neighborhood and was even in charge of establishing Israel’s nuclear reactor in Dimona. Yet he never stopped believing in peace and reconciliation with the neighbors. Perhaps the best example is the one that Peres is most identified with, the 1993 Oslo Accords, for which he, along with Yitzhak Rabin and Yasser Arafat, received the Nobel Peace Prize. Rabin initially was skeptical about pursuing negotiations with Arafat and the PLO, but it was Peres and his advisers who convinced him to give it a try. It is easy to be critical of Oslo given developments of the 23-plus years since its signing. But Middle East history tends to be written not over a period of years or even decades; sometimes one must look back over generations to discern the impact of certain events. One outcome of Oslo was the signing of a peace agreement between Israel and Jordan, which has resulted in close security cooperation on Israel’s eastern border. With terrorist groups such as ISIS operating in Syria, this cooperation has become more important than ever. Conflict between the Zionist movement and Arabs native to Palestine over the land between the Jordan River and Mediterranean Sea existed for almost a century leading up to Oslo. It was only after the signing that both Israel and the Palestinians, for the first time, at least implicitly acknowledged the need to divide this area into separate states, a conclusion the international community had come to long before; next year will mark the 70th anniversary of the UN Partition Resolution calling for a Jewish state and an Arab state in British Mandatory Palestine. Clearly, the Palestinian Authority, the governance body that emerged from Oslo, is not everything we hoped it would be. However, it did produce some outstanding leaders, such as former PA Prime Minister Salam Fayyad, who worked hard to advance much-needed educational and economic development for the Palestinian people. With the help of the United States and Jordan, a competent Palestinian police force was developed that, to this day, notwithstanding stagnation in the peace process, continues to work reasonably well with Israel’s security personnel to prevent terrorism. Talk has turned to an alignment of interests between Israel and the Sunni Arab states in response to the extremist and hegemonic Shiite regime in Tehran. The Saudi/Arab League Peace Initiative presented in 2002 is gaining some traction, including within Jerusalem’s government circles. Although the Arab states maintain publicly that they cannot significantly move forward without progress toward resolving the Palestinian issue, the parties are, in fact, collaborating, albeit quietly. Without Peres and the breakthrough achieved in Oslo, this opportunity probably would not exist. I had the privilege of participating in many meetings with Peres over the years. Even in small intimate settings, unless you were sitting right next to him, you had to strain to hear the soft-spoken former president and prime minister. Peres consistently painted a picture of a new and, yes, idyllic Middle East in which Israel and Arabs join forces to enhance the quality of life for all peoples in the region. “Let us build hotels, not bombs,” he often said. In 2004, during a rare visit to the Garden State to receive an honorary doctoral degree at Seton Hall University, Peres warned against the dangers of Islamophobia, observing that the war in the Middle East “is not a war against Muslims…. It is a war for everybody, including the Muslims.” This message resonates deeply today. There is another possible New Jersey nexus. In 1947, Prime Minister David Ben-Gurion assigned Peres, then just 24, the responsibility of procuring arms for the inevitable battle for independence. One wonders whether in that role he might have encountered a group of Monmouth County residents who illegally transferred arms to the Haganah in pre-state Palestine. The dramatic story of the late Zimel Resnick, who, together with his partner in crime, Charles Lowy, smuggled some 10,000 guns and explosives, is recounted in the 1981 book Peddler to Suburbanite: The History of the Jews of Monmouth County, coauthored by Dr. Alan Pine, Jean (Hershenov) Klerman, and Aaron H. Lefkowitz. I spoke with Dov Ben-Shimon, executive director/CEO of the Jewish Federation of Greater MetroWest NJ, who previously served as an Israeli diplomat in the Ministry of Foreign Affairs. Ben-Shimon recalled that as a young cadet in 1995, the day after Rabin’s assassination, he and his colleagues were in the situation room in the old MFA caravans. The atmosphere was extremely tense. Peres, thrust by circumstance into the role of prime minister, walked into the room with a huge security entourage. He gently put his hand on Ben-Shimon’s shoulder, smiled confidently, and immediately created a “calming effect” on everyone in the room. 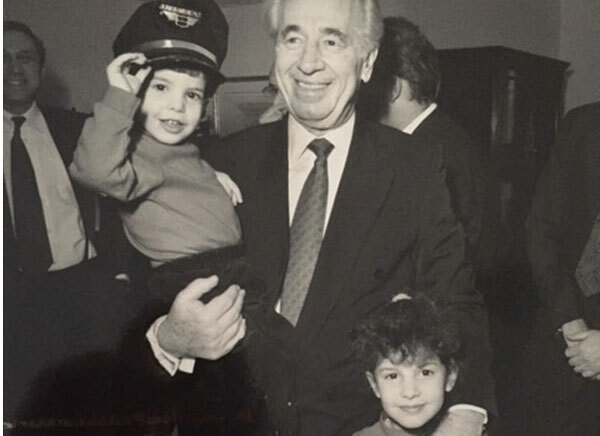 Ben-Shimon’s story reminded me of an experience our family had with Peres at the 1993 Jewish Council for Public Affairs Plenum in Washington, DC, where he served as our keynote speaker. Very much wanting my little children to meet one of Israel’s great leaders — dor l’ dor, generation to generation — we approached him. 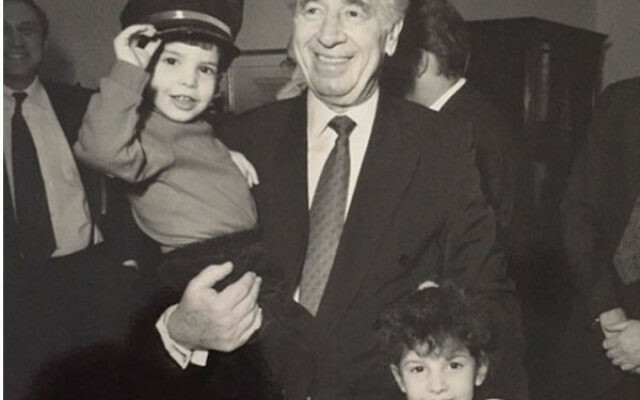 Peres immediately reached down to pick up my then three-year-old son, who comfortably nestled in his arms, and put his arm around my six-year-old daughter. I saw firsthand that, though steely in his resolve to protect Israel and to pursue peace, there was also a soft and sweet side to this historic giant. Some derisively refer to Shimon Peres as just “a dreamer.” But allow me to stand with our departed hero as a dreamer too, if — in the face of today’s rampant pessimism — it means recognizing the importance of Israel always striving for a secure peace with its neighbors.